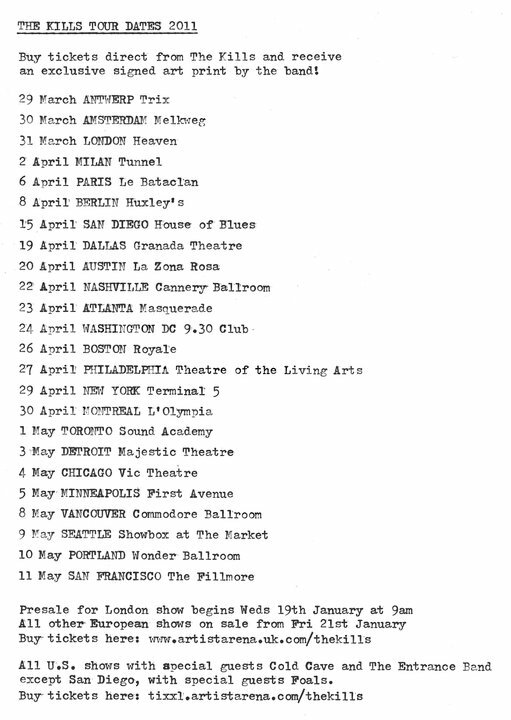 After news a few weeks ago that The Kills had finished work on their fourth studio album they have just announced the dates for their 2011 tour via the image above on their Facebook page. Check it out up at the top. Kind of dissappointed there's only the one UK date and it's in London but hey, beggers can't be choosers. You can also see the dates over on their official site along with where to order your tickets. Jamie and Alison will be gracing a venue near you very soon with support from the likes of Cold Cave, The Entrance Band and Foals.